16 herbs (Chamomile Flower Echinacea Sarsaparilla Root Golden Seal Celery Seed Alfalfa Dandelion Root Eleuthero Root Horehound Root Licorice Root Ginkgo Biloba Passion Flower Thyme Saw Palmetto Berries Angelica Root and Cascara Sagrada). Herbal Rainforest™ has a pleasant-tasting mango flavor and can be consumed straight from the bottle or combined with your favorite fruit or vegetable juice. Adults: Mix one ounce per 100 pounds of body weight 1 to 2 times daily. Children: One teaspoon for every 25 pounds of body weight. WARNING: If you are pregnant nursing or taking medications consult your healthcare professional before using this product. If taking MAO inhibitors consult your healthcare professional before using this product containing Ginkgo Biloba. 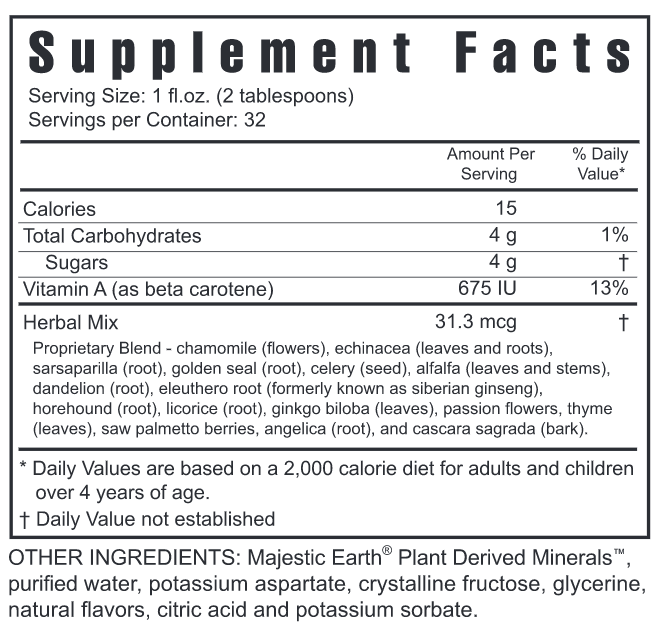 Click the button below to add the Rainforest Mineral and Herbal Supplement 946ml to your wish list.